When you are living with MS, mobility problems were probably one of the first things to go wrong. Balance problems. A dragging foot. Tripping over things that weren't there. A heavy feeling in your limbs. Unexplained weakness. When you found out that multiple sclerosis was the cause, you may have been relieved, scared, or angry, all at the same time. If you knew anything about MS, it was probably the horror stories that popped into your mind. The stories about friends mother-in-law who progressed so rapidly that she ended up in a wheelchair, almost overnight. Or the neighbor with MS who was always falling and now needs a power chair to get around. You've probably asked your doctor questions like - "will I end up in a wheelchair." Depending on when you were diagnosed, you may or may not end up in a wheelchair. Your main problems may be with your upper body or other invisible symptoms like cognition or vision problems. Here are some of the reasons people with MS need to use mobility aides. If you have one or more of these symptoms, you need a mobility aid, and you need to use them to be safe when moving around. You also need to consider using them to conserve your energy. If you spend all of your time trying to get from place to place, by the time you get there, you'll be wiped out and unable to enjoy the event. If you are walking as therapy, that's one thing - and then you will have a therapist spotting you. If you are walking unaided because you're embarrassed, then that's a whole other ball game. It can mean the difference in falling and breaking something or just managing the strength you have to be able to do the things you want to do. Falls and other accidents can be prevented when you use a mobility aid properly. 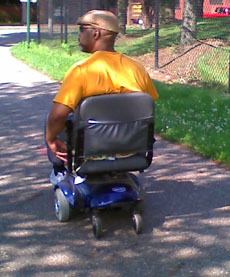 The following is a list of mobility aides you may need to use in order to remain active. You may not always need an electric scooter, but they're good to have when you need to walk long distances. 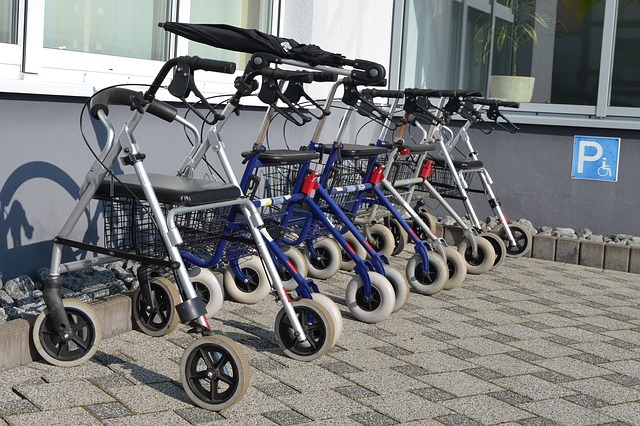 If you have more than one kind of aid, on your good days you can use a cane or walker, and on days when you're feeling weaker, you'll have a rollator or scooter to get around. When living with MS, mobility aides help to keep you independent. You are able to get around to places you used to, sometimes on your own. This can help relieve some of the emotional stress of living with MS. Being able to get out of the house - go for a walk/ride is freeing. Not only physically, but emotionally. And that's a good thing for MSers. Have you always wanted to travel? Your dream can be a reality. Click here to read about the travel issues MSers can overcome. Go from Living with MS--Mobility Issues back to Living with Multiple Sclerosis.